Over the past few years, we’ve been experimenting with ways that learners can tinker at the intersetion of the physical and digital world. This summer for our “computational creatures” and “crafting with code” camp programs, we’ve prototyped a progression of workshops and prompts to encourage participants to make mistakes, test out half baked ideas, play with programming concepts and collaborate in large and small ways. As a way to share some of our explorations and to grow the community of educators working in this area we developed a “creative coding” professional development workshop to try out ideas as learners and reflect on the implications for formal and informal learning settings. I partnered with Saskia Leggett, formerly the outreach manager from the Scratch team at MIT media lab to put together a plan for a fun and engaging workshop. We wanted to share a variety of activities that made use of scratch programming, micro:bit & moto:bit and chibitronics as well as a classic tinkering activity. To organize the discussions, we modified some of the thinking routines from theAgency by Design group at HGSE as a way to reflect about the experience. Before the workshop we collected a series of blog posts from our friends and colleagues who have been doing work around this topic. It was inspiring and focusing to learn from them and bring their insights to the workshop. Another fun prototype that we tried was putting together a blank zine with spaces for each of the discussion topics as an artifact that participants could look back on after the workshop and reflect about their thoughts and questions. And finally we wanted to prepare a set of materials so that participants could keep exploring these ideas after the workshop. We gathered a collection of the microprocessors, hard-to-find parts, electronic components along with a resource guide to make it easy for the educators to continue exploring the ideas after the weekend workshop. We also tried to emphasize the social element of the professional development experience. There was a great group of educators that participanted from schools, libraries, museums and universities and we wanted to make sure that everyone had the chance to get to know each other and chat about their work. To that end, the workshop started with an informal reception on friday night where we enjoyed food and drinks at the main Brightworks school campus. We put out materials for participants to start messing around with the materials and make micro:bit nametags on cardboard bases with pipecleaner, colorful monsters, googley eyes and washi tape decorations. It was a fun and low key chance for everyone to get to know eachother and become a little more familiar with the microbit and makecode and I was excited to see that the group started exploring more advanced functions like the A & B buttons, the shake sensor and directionality of the accelorameter. The next morning, we started with a group discussion around creative coding using the compass points framework. Participants shared with eachother and the larger group about what was exciting and worriesome about creative coding as well as what they “needed to know more” and a statement or stance about this topic. Then we started messing about with a classic tinkering activity, art machines, where participants used batteries, motors, recycled bodies and markers to create unique and whimsical mark-making robots. We added the DAGU gear motors with slow and fast axels as well as our lasercut hubs to the materials set to try and encourage the group to think about this familiar activity in a new way. As well some of the examples included more advanced elements like clothespin switches to inspire more complex designs. The group came up with some impressive designs and in the conversation after the activity we reflected together about the ways in which the materials and the examples could encourage more computational thinking (patterns, loops, debugging) with just physical materials. In the afternoon, we moved to our first coding activity, undersea circuitry using copper tape, LEDs and the chibichips. We’ve been prototyping this idea since Bay Area maker faire and it was great to test it out with a group of colleagues. There was lots of great investigations with the materials with each of the participants working in pairs to create their additions to our collaborative sculpture. There were plenty of awesome projects including fish that kissed to light up a LED heart, a little scene of goldfish and jellies, an animated scuba diver and more. It was fun to see how partners worked together to share knowledge and learn from each other. One really fun projects from Maura and Junnan contained some really complex programming concepts to control a servo, light sensor and a big gumdrop LED as a pearl. They both had some experience with text-based programming and it was nice to see how they could go deep with the technological aspects of the workshop. Another project that really took the aesthetic element to a new level was an angler fish built inside of a starbucks traveler container. I loved how the group used this familiar object to accomplish a unique idea. At the end of the first day, we went around the room and shared our works in progress. It was so cool to see how the wide walls of the activity resulted in so many different possible pathways. The next morning we stared with a quick icebreaker activity inspired by Ricarose Roque’s three work scratch stories. Each of the workshop participants put some words into a shared deck. Next we formed pairs, drew out three words and spent about thirty minutes creating projects with the goal of getting the group ot guess their words. It was good to get the chance to play around a bit with the new Scratch 3.0 while experimenting with an open ended activity that could be used as an introduction to visual coding. And there was a nice collaborative element as the group went around the tables, tried to guess the words and compared notes about what blocks they tested out in their projects. Keeping the theme going in the morning, we moved into a discussion of an except from Lifelong Kindergarten by Mitchel Resnick. This was a great chance to think more deeply about the 4 Ps of computational tinkering and discuss how we can develop activities that allow learners to explore their own ideas. In the afternoon we worked on twisted turtles (programmable art machines that used micro:bit, moto:bit, DAGU motors, servos and sensors. We’ve been experimenting with this take on programmable robots that make use of recylced materials, wood and cardboard scraps, lasercut hubs, and a variety of attachment methods so that participants could develop more homemade and imperfect designs. Just like in our summer camp, pairs started by just playing around wih the individual components. Pretty quickly, everyone worked on controlling the speed and direction of the motors, the onboard buttons and servos. Some of the art machines that groups worked on were pretty amazing! One of the teams worked on a project that traced ever expanding spirals. It was really fun to see how another group came over and snapped a photo of their code to integrate into their projects. Another group took their contraption in a more narrative direction with a fire fighting turtle theme. They wrote four shakespearean riffs like “fire by any other name would burn as hot” and worked to program the bot to randomly display the messages. One really cool machine used the LED arrary on top of the microbit as a light sensor and made a cockroach themed bot. Workshop participants could use flashlights to trigger the realistic scuttling motion. At the end of the day we gathered around a big sheet of white paper on the floor and shared our works-in-progress. As the groups shared their machines they talked about some of the things that they were proud of and the challenges that they encountered along the way. Some of the things that the group shared included the fact that there were so many simple things that could go wrong, the power of collaboration and the importance of wide walls for computational tinkering activities. The entire weeked was a great chance for us to share some of our prototypes, learn with and amazing group of educators and reflect about the possibilities for integrating creative coding into classrooms, museums and makerspaces. 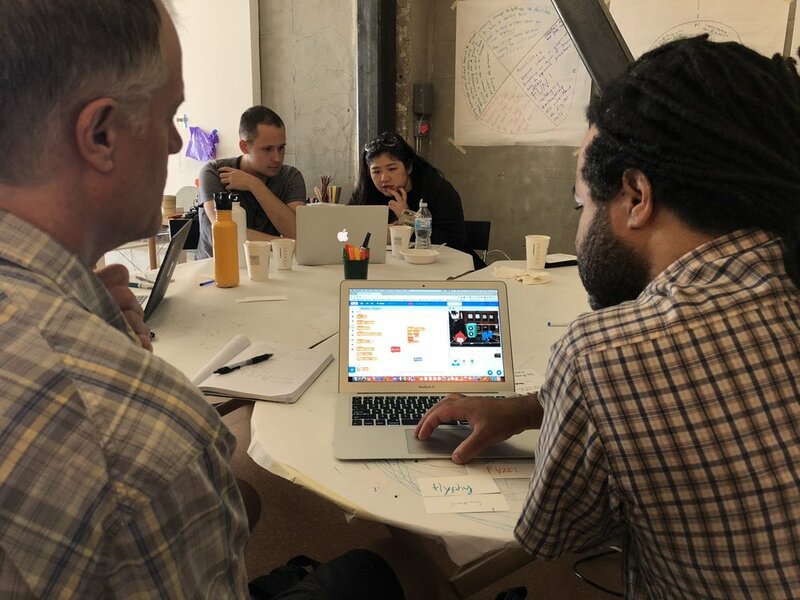 We’re super excited to see how these ideas evolve after this workshop and look forward to more chances to develop more professional development workshops around creative coding and computational tinkering.